The Gran Hotel Son Net – a former family home, which opened as a luxury boutique hotel in 1998, took the award at a recent London presentation. 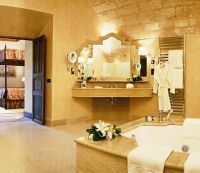 The 5-star hotel in rural Mallorca is owned by American property developer and hotelier David Stein, and his business partner Terry Giles, and is one of the two hotels Stein retained when he sold his interests in Franklyn Hotels & Resorts (formerly Stein Hotels & Resorts). “This is a spectacular achievement for us”, Stein says. “We are delighted and proud to have won this prestigious award, which is the culmination of all the hard work of the Son Net team, under the direction of General Manager Björn Wild”. Unlike many hotels on the Spanish holiday island, Son Net was open throughout last winter, for the first time. During an interview last December, Stein told me he had taken the decision to remain open because “the right people for my team don’t want to work for just six to nine months of the year”. The decision has enabled him to make some key new appointments this year, including the recent appointment of Mallorcan chef Sergio Olmeda. The hotel is a hilltop mansion on the 17th century Son Net estate, overlooking the village of Puigpunyent and in the foothills of the UNESCO World Heritage Site Tramuntana mountain range. Stein originally bought it as a run-down property to develop into what became his family home for seven years. He did it preserving the traditional character of the mansion, and using authentic local materials. 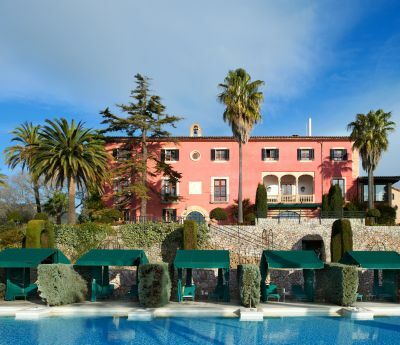 When business and family circumstances meant relocating back to the States, Stein turned the property into a small luxury hotel, believing that “Mallorca needed quality”. His private art collection – including originals by Hockney, Warhol and Chagall – remains on the walls of the hotel, giving it the feel of a private home: “People treat it like they’re house guests – they don’t treat it like a hotel”, he says. Facilities include 31 rooms and suites, two restaurants (one seasonal), 30m swimming pool with private cabanas, beauty/treatment centre, and a dedicated conference room for up to 50 people – making it ideal for corporate strategy and directors’ meetings. Palma city centre and the island’s airport are within 25 minutes’ drive, and six of Mallorca’s 23 golf courses can be reached within 30 minutes – all enhancing the hotel’s appeal to the meetings as well as the leisure market. Son Net’s guests will soon be able to enjoy more produce from the estate land, following the planting of an organic vineyard of the Malvasia grape variety (grown in the island’s mountainous region since the 15th century); there are also plans to regenerate the estate’s olive trees and produce their own oil. Organic vegetables, fruit, and herbs grown on the estate are used in the hotel kitchen. The hotel is closing briefly from 9-20 December. Son Net has a sister hotel, Château Eza, a romantic 400-year-old property in the medieval hilltop village of Eze, perched 400m above the Mediterranean, on the Côte d’Azur – just 10 miles from Nice Airport. Once the home of Prince William of Sweden, it now has 12 rooms and suites, restaurant with Michelin star, and a meeting room for up to 20 people. In 2011, the hotel closed during a five-month-long total refurbishment, costing €2m. Château Eza’s awards include Condé Nast Johansens 2011 ‘Most Excellent Room with a View’.